This simple example shows some logic operations supported by the BITIS module. The following example shows the plotting capabilitites of methods plot and plotchar. The method plot uses the matplotlib to produce graphic drawing of the given signal as a square/rectangular wave. The x axis represents the time, the y axis represents the logical levels. The method plotchar uses the box line drawing characters from unicode for drawing the best approximation of a graphic representation of the given signal. Below there are two representations of the same test signal. This is the graphic plotting result using plot method. This is the semigraphic plotting result using plotchar method. The figure shows a sequence of plotting of the same test signal with increasing resolution. Resolution is the length of the plotting character string, it is printed at line beginning and spans from only one chararacter until a string 76 characters long. When resolution is too low to represent all signal transition edges, plotchar puts an heavy vertical line as symbol of multiple edges. In this example, plotchar is called with the argument max_flat=4 . This means that a signal constant level elapsing more than 4 characters is compressed (in time) to be of length 4 characters. This characters drop is marked by the ‘x’ chararacter that can be seen in the last four semigraphic plots. When this happens, it is important to keep in mind that the x axis time scale is no more uniform. 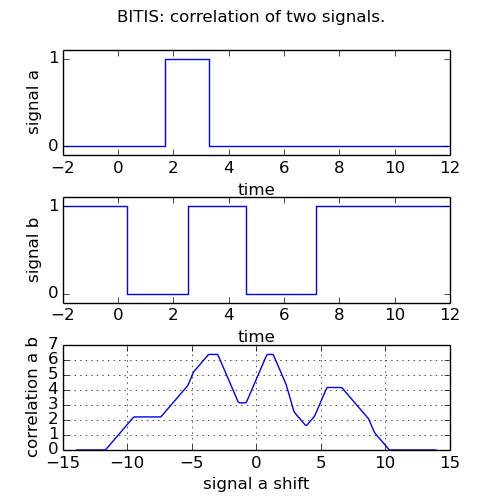 The following example shows the plotting of two random signals and their correlation function. This is the plotting result. The following example shows the signal of an asynchronous serial interface coding the ASCII character “U” with 8 character bits, odd parity, 2 stop bits and 50 baud tranmitting speed. This is the plotting result. The x axis units are milliseconds. The following example demonstrate a phase recovery from a disturbed periodic signal whose undisturbed original is known. The original signal is a square wave of 50 cycles @1Hz, 50 % duty cycle. 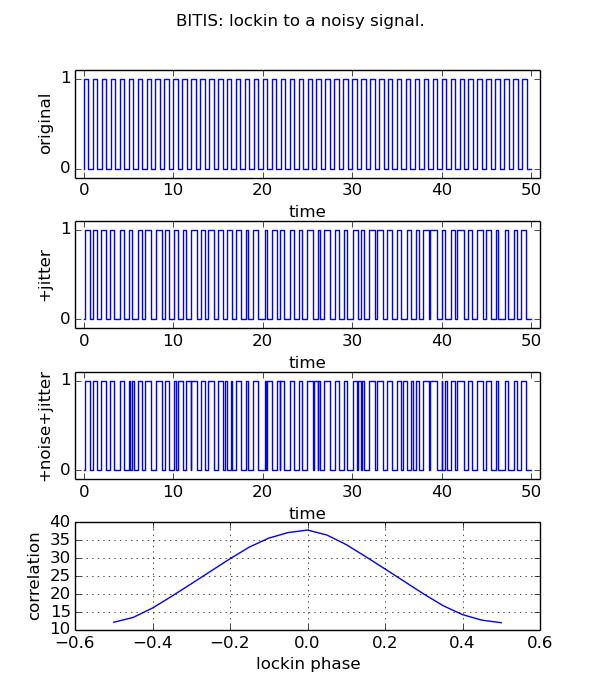 A gaussian jitter is added to the original signal change times and the result is xored with noise pulses to simulate transmission line disturbances. # generate the original signal: square wave, 50 cycles @1Hz, 50% duty cycle. The plot shows the original, the disturbed signal and the correlation among them, correlation that reaches a maximum when the original has that same phase of the disturbed original. The following example shows the generation of a modulated signal, given a random code and a set of symbols. The modulated signal is obtained concatenating in time the symbol corresponding to a code value. Then the modulated signal is demodulated by maximal correlation symbol estimation. As a byproduct, the signal/symbols correlation matrix is obtained as shown below. The example does not take into account any signal alteration by noise. The plot shows the set of four random symbols. Each symbol has an elapse time of 4 seconds. 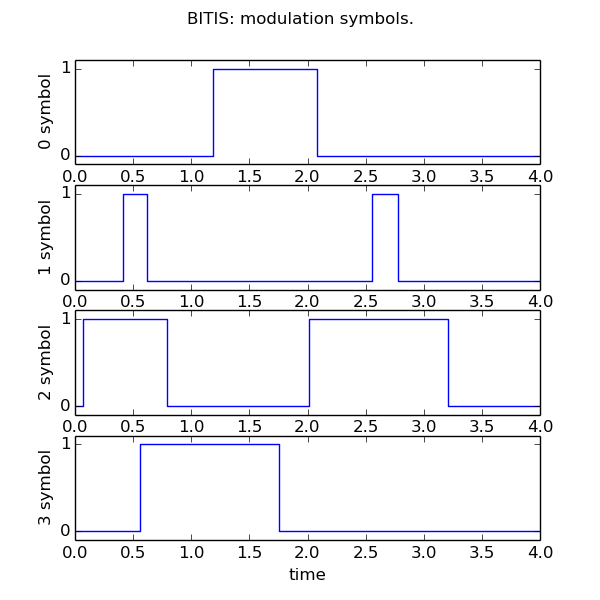 The plot shows the modulated signal with the boundaries between the symbols. For each symbol time, the code value is shown. 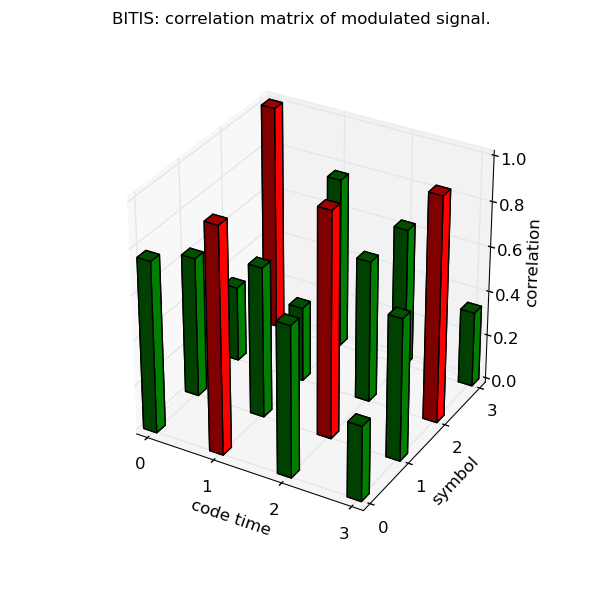 The plot shows the symbol correlation matrix of the modulated signal. The correlation value reaches the maximum where the correlating symbol is equal to the modulating symbol. For each code time, the symbol with maximum correlation (+1) is marked in red.